Horizon Windmills are a unique free energy source for your lifestyle block or farm, wherever water is needed to be pumped and distributed for stock or home water supply. 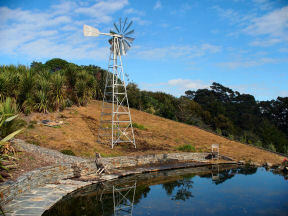 Horizon Windmills are custom built to your requirements using quality galvanised steel. The engineer has designed these mills with a long life water pump with no rubber washers to require periodic replacement. They are built to run reliably and with minimal maintenance (patent pending). The designer and manufacturer of Horizon Windmills has spent hundreds of hours achieving a seamless pumping system and brilliantly quiet design. One of the prototypes maintained smooth, efficient running through one of the roughest storms in recent history, Cyclone Bola. (1988). South Island customers: After finding the right people and systems in place for freighting recently, we can now land a windmill kitset to your door, eg. around Christchurch for $7195 total - a saving of approx $2000+ for me to transport and install. They are easy to put together with a minimum of tools (can be done by one person),with instructions and diagrams provided. 92 Aeroview Drive, Beach Haven, North Shore City.